Cypress Wood Shingle Slope Roof Classic White Vinyl Birdfeeder CS 36 X 14 in.-BEST PRICE! Wood Shingle Sloped Roof Classic White Vinyl Birdfeeder CS 36 x 14 in. 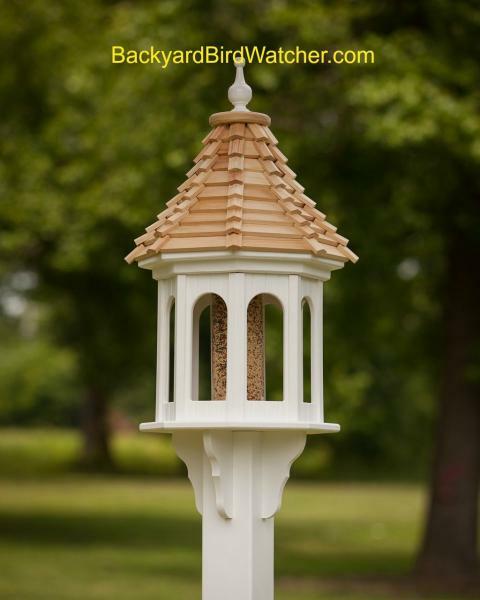 Classic Cypress Shingle Slope Roof Classic PVC Birdfeeder CS 36 X14"
This fancy vinyl PVC gazebo bird feeder will not crack, rot, split or fade and will almost certainly last a lifetime with little or no no maintenance. Beautiful Classic White Gazebo Style Vinyl Design Bird Feeder is octagon shaped. NOTE:Post NOT included but the sleeve to mount the 4X4 post IS included. The sleeve is 4 inch sleeve that mounts on a 4 X 4 post. Post available locally in most home improvement stores. OPTIONAL White vinyl square 4X4X72 post cover available at checkout for $60.00.